Setup any numbers of consecutive connection timeout to get alerts - Monitoring TCP ports and alert you only when the TCP ports connect timeout on a continuous time period. You can setup any # of consecutive 1 or 2 or 3,...10...20..100..500.. timeout to send you alerts. Alert you only when TCP ports connect timeout the first time reach the consecutive # - No keep sending you alerts when servers remain timeout. Alert you again when connection get back to normal then alert you next time get consecutive timeout. Keep monitoring 7/24 and send you alerts. Save timeout detail information to log file and separate the log files by date automatically. If you need batch update or maintain host configuration file - click START then input %appdata%. Go to "Users\ username\ AppData\local\VirtualStore\Program Files (x86)\Port_Alert". Update host.ini. Set up # of consecutive timeout to trigger ALERT. Column "Timeout #" is the # of consecutive connection timeout which you can define. Column "Count" is the count of consecutive timeout (down). Alert will be sent only when Count = Timeout. 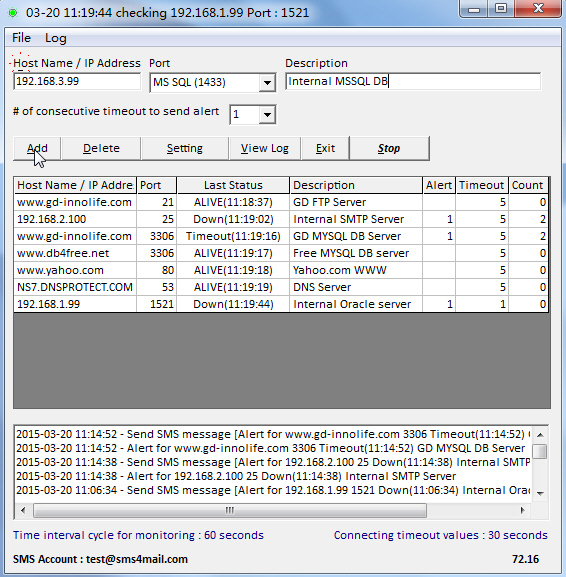 Ping_Alert - PING monitor and alert you when PING loss on a continue time period.